Article describing equations and restrictions. I'll illustrate the calculation process with an example problem (but the principles are the same for the other spreadsheets). All the spreadsheets require Excel's Goal Seek functionality because the calculations are iterative. 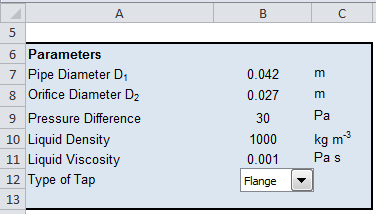 Step 1: Define the parameters as specified above, and also include an initial guess value for the orifice diameter. 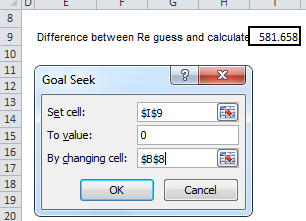 Step 2: Go to Data > What If Analysis > Goal Seek. Set the difference in the guess and calculated values of the Reynolds number to zero by varying the orifice diameter. 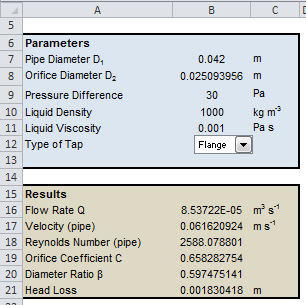 As soon as you click OK, Excel will give the correct orifice size, as well as other parameters, like the flowrate, orifice coefficients, Reynolds Numbers etc.